The first floor is entered by the staircase entrance from the ground floor, and contains an office space, lounge, kitchen and dining area and the staircase entrance to the second floor bedroom. 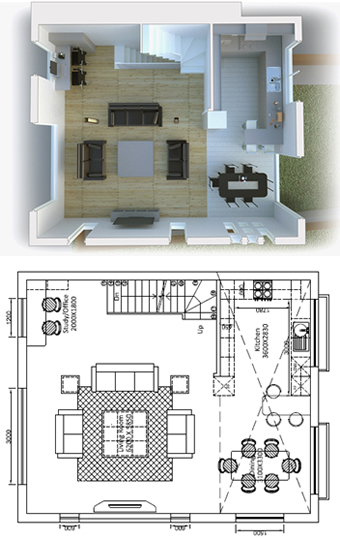 The first floor provides the main open plan living space with a large kitchen and dining area. These areas can be inter-changeable, ie the dining table would sit as comfortably in front of the large picture window with panoramic views overlooking the Oval and across to Arran at the front, as it would in the area adjacent to the kitchen, overlooking the garden at the rear. The south westerly facing windows above the kitchen and in the kitchen dining area allow natural sunlight to flood the living areas creating an ambient living space. The set of 9 windows in a square not only beautifully allows sunshine in from the South, but also form the unique design signature in tribute to the ZEMCH logo, inspired by Charles Rennie Mackintosh and designed by Dr Masa Noguchi.